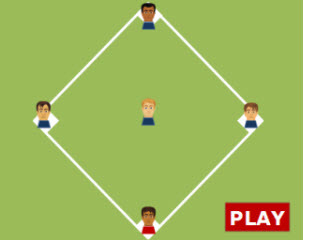 Have fun with this cool Baseball Math Division up to 100 Game to help develop your division skills. It is a great activity for classroom review and reinforcement. Students can play the game alone, or in two teams to compete for a chance to score homeruns. For each correct answer, the teams will get an opportunity to score points. This game is a lot of fun and can be played on computers, iPads, and other tablets. You do not need to install an app to play this game on an iPad. Have fun adding decimals! Return from Division up to 100 Baseball Game to Baseball Math Games, 3rd Grade Math Games, or to Math Play.